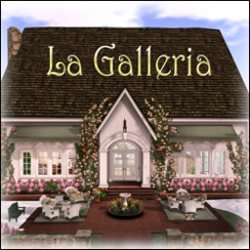 Opening tomorrow, Thursday, March 6 at 12 pm slt is a delightful new installation by Cica Ghost entitled Little Village. Few places make me smile on first sight but Little Village did, with its quirky thirty little homes dotted around the edge of the sim, some single, some in little clusters, their shapes silhouetted against the sepia sky. They look old—indeed, nothing about this village seems new, as even the flowers and trees look weathered. Perhaps the houses on the little hillocks once stood straight, but they've long since begun to tilt and slide down—or maybe that's just how they've always been. Each of the comical stone, brick or cement homes (some in need of a fresh coat of paint) has a door and step, a window or two or three, and a pointed roof with a chimney jutting out at an odd angle. We sense people live here, because a couple of cats can be spotted in windows. (Can you find them?) Or it could be, as Cica told me playfully, "Maybe only cats live here." The village possesses a naïve simplicity and charm that's entirely disarming, and I remarked to Cica that it reminded me a little of Dr. Suess books from my childhood, as if Mr. Brown and Mr. Black might emerge from their homes at any moment. Surrounding the homes is an amusing environment of stubby trees, flowers and grasses, mushrooms and tree stumps, fences, barrels (with spots on which to sit), a water pump, logs, a cart, a windmill, and walkways that stop and start without meaning. With its brown and gray windlight setting, it evokes fall or perhaps more strongly a foregone time and quietude. 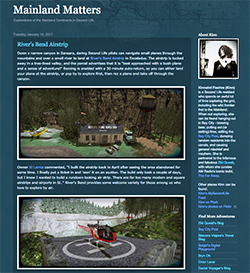 (If you're using a viewer that doesn't automatically change your windlight settings, look for something similar to what you see here, and click to zoom in on these photos—I'll add more images on my flickr stream.) 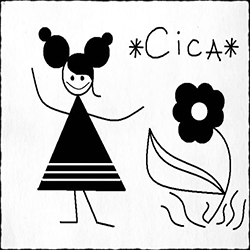 At the landing point, you'll spot a tip jar and a landmark giver to Cica's delightful shop, where you can peruse and purchase many of her odd little creations. Special thanks should go to Erythro Asimov for contributing the sim on which Little Village has come to be.